New England Conservatory can always be counted on for the quality of its staged opera productions. Its coming attraction is Offenbach’s hilarious La Périchole in a run at the Cutler Majestic Theater from February 11th to 14th . To be sung in French with English spoken dialogue, La Périchole traces the adventures of a pair of street singers too poor to get married and the complications placed in their way by a lecherous viceroy. The plot is based loosely on the life of Micaela Villegas, a celebrated 18th-century Peruvian entertainer, who was also the subject of Prosper Mérimée’s one-act comedy, Le Carosse du Saint-Sacrement; Jean Renoir’s loving cinematic tribute to the theater, Le Carosse d’or, starring Anna Magnani; and, more seriously, in Thornton Wilder’s The Bridge of San Luis Rey. Performed by excellent singers and instrumentalists from the NEC student body, the production will be updated to Lima, Peru in the “hot, hot 1950s” by stage director Joshua Major. Currently also on the faculty of the University of Michigan, Major is known for an impressive repertoire of productions throughout the United States and Canada for over 25 years. 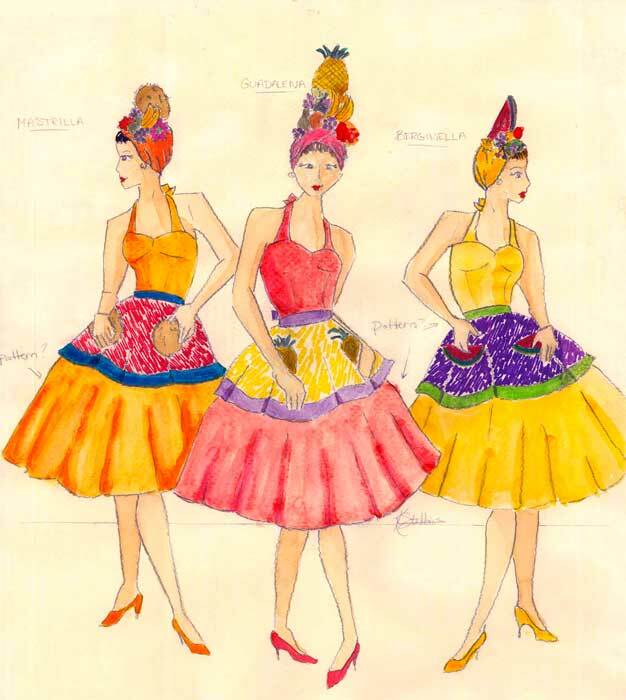 The costumes, which appear redolent of Carmen Miranda and her top-heavy “tutti-frutti hat,” are the work of designer Katherine Stebbins. Stebbins received her MFA in Costume Design from Carnegie Mellon University in 2009. From 2009-2011, she designed costumes for shows in Chicago including It’s A Wonderful Life at American Theater Company and Collaboration’s Sketchbook X: Exponential. Her most recent stints include one as assistant costume designer for a Macbeth at Chicago Shakespeare Theater. She has agreed to share some of her sketches for BMInt readers. The conductor will be Joel Revzen, the Principal Conductor of Arizona Opera, where he has led over 100 performances featuring such renowned artists as Stephanie Blythe, Dolora Zajick, Christine Brewer, Greer Grimsley, Nancy Gustafson, and Gordon Hawkins. Revzen will also take over as Artistic Director and Principal Conductor of the Lake Tahoe Summerfest, which will have its inaugural season this summer.